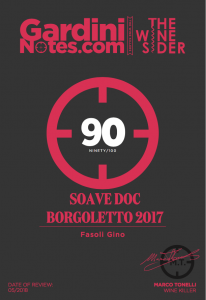 Il nostro Soave “Borgoletto” 2017 è uno dei Top 15 Soave secondo Marco Tonelli di Gardini Notes. “Garganega on primarily calcareous soils. Soft aromas that mix acacia blossoms and elder ower with ripe tones of white peach and pineapple. In the mouth, the juice dominates the smoothness, thanks to citrusy sensations of lemon and citron that are completed by suggestions of kiwi. Flavorful background“.